In the Russian tradition, kvass was not so much a refreshing beverage as it was the base of all dishes, much like broth is today. Now, a large Russian plant has revived the old recipe for white kvass and hopes to re-introduce Russians to the culinary practices of their ancestors. On the surface, Russian kvass that is usually served to foreigners is not very different from the sodas they are used to: It is dark, transparent and sweet. However, the beverage that was recently released by the Ochakovo factory looks completely different: It is virtually white, close to the color of blond hair. This is “white kvass.” Its formula most closely resembles the ancient Russian recipe that existed for a thousand years, until the end of the 19th century. 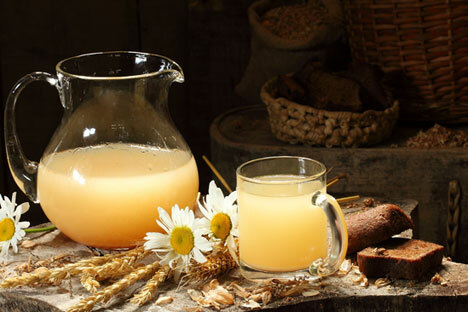 “When the Russian peasant would go into the field, he would take with him a milk jug of this kvass and a hunk of bread. In theory, one can even do without the bread: Kvass contains the basic nutrients,” says Yevgeny Shatilov, director of the kvass museum at the Ochakovo plant. The 20th century destroyed not only decades of empires, but also the traditional demand for kvass. Kvass became completely different — neither better nor worse, just different. Now, this drink, once again being prepared according to the traditional canons, can boldly be considered an innovative product. It had not been made under industrial conditions for about 100 years, not to mention on such a scale: In the factory, the juice ferments in 17,000-gallon tanks. In order to re-create the formula, Svetlana Golubeva, the plant’s production manager, traveled to dozens of villages, visiting hundreds of “babushkas,” or old women. “Our production managers finally learned that white kvass is made in some villages in the Tambov, Ryazan and Voronezh regions,” say company spokespersons about the history of the creation of their product. The white kvass was found, and the babushkas were willing to share secrets — but factory technology is one thing, and a village recipe is quite another. “You take two or three handfuls of rye flour, sprouted wheat, you cook it at a rolling boil. Then it needs to stand. For how long? Well, until it’s ready,” a babushka-kvass maker would say. The culture required for the recipe remained particularly enigmatic: It was simply passed from house to house, from generation to generation. It was unclear what organisms it contained — the village babushkas had never formally studied microbiology. It took several years to reconstruct the manufacturing technology of the new-old beverage. The ingredients are: water, wheat malt (sprouted wheat), rye (whole grain), sugar and salt. The fermentation is twofold — yeast (as in beer) and lactic acid bacteria (as in kefir). The specific microorganisms that are used remain a company secret. “Dark kvass is a symbol of the 20th century,” Shatilov says emphatically, beginning to tell his version of the history of the kvass affair. Traditional Russian kvass was always on the lighter side, especially when wheat was used rather than rye or barley. It is still not entirely clear why kvass started to become darker at the beginning of the 19th century. Shatilov does not rule out the possibility that this was linked to the increasing popularity of dark beer. In any case, these beverages are closely related. Initially, in Rus, only light beer existed. Peter I brought porter to Russia from Europe, but this drink did not spark any particular enthusiasm. Dark beers did not become popular in high society until Catherine’s reign, if not later. Kvass darkened along with beer. It is most likely that kvass’s ultimate standard — transparent, dark — was set during the rule of Nikita Khrushchev, who was enamored with Pepsi-Cola and sought a homegrown equivalent to it. White kvass appeared in bars relatively recently. Sales growth is still modest — people are not used to it. Imagine that you introduced green milk or sweet sausages to the market. Of course, they could succeed, but consumers’ stereotypes about food would need to be fundamentally readjusted.